It’s Asparagus season! There is nothing quite like cooking asparagus that’s been pulled straight from the ground. As the British asparagus season is a mere eight weeks, I figured I had to hurry but am very happy with the result. 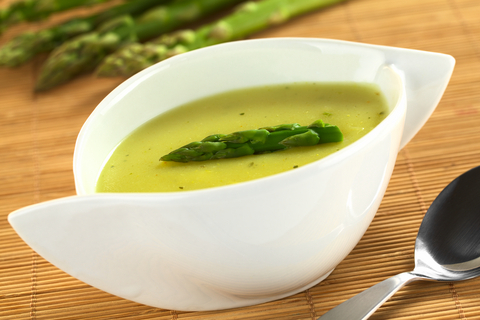 This asparagus soup has a beautiful flavor and is very easy to make. I hope you will enjoy. Prepare the asparagus by cutting or snaping off the ends of the stalks where the colour starts to change. Trim a couple of the asparagus tips to use as garnish. Then chop the remaining green parts of the asparagus into 2,5 cm (1 inch) lengths. Rinse the asparagus thoroughly before cooking. Melt the butter on medium heat in your stockpot. Gently fry the shallots and leek for around 10 minutes, until soft but without colouring. Stir in the chopped asparagus stalks, put the lid on, and let it sweat for another 10 minutes. Don’t forget to give it a stir now and then. Pour in your chicken stock, or vegetable stock if you prefer a vegetarian soup, add the diced potato and bring to boil. Once boiling reduce the heat, partially cover your stockpot and let the soup simmer for 20 minutes. In the meantime blanch the asparagus tips in a pan of boiling salted water for 2-3 minutes then drain and rinse in cold water. Drain on paper towels and reserve for the garnish. Turn off the heat and let the soup cool down for a few minutes. Then purée the ingredients with a hand blender in the stockpot or puree in batches in your blender. Return the soup to a clean pan, stir in the crème fraîche and season to taste with salt and coarsely ground pepper. When ready to serve, bring back to a simmer, ladle in to bowls and garnish with one or several asparagus tips. Asparagus is a favorite in our house. This will be one of my next soups to make. Thanks for sharing.